How to Cite This Chapter: Pernica JM, Goldfarb DM, Sawiec P, Mrukowicz J, Szenborn L. Acute Pharyngitis (Tonsillitis). McMaster Textbook of Internal Medicine. Kraków: Medycyna Praktyczna. https://empendium.com/mcmtextbook/chapter/B31.II.3.3 Accessed April 24, 2019. Fine AM, Nizet V, Mandl KD. Large-scale validation of the Centor and McIsaac scores to predict group A streptococcal pharyngitis. Arch Intern Med. 2012 Jun 11;172(11):847-52. doi: 10.1001/archinternmed.2012.950. PubMed PMID: 22566485; PubMed Central PMCID: PMC3627733. Acute pharyngitis refers to inflammation of the mucosa of the pharynx, which frequently includes the tonsils (tonsillitis) and is caused by infection or irritation. 1. Etiology: Etiology depends on the patient’s age. In adults, pharyngitis is most commonly caused by viruses—respiratory (eg, rhinovirus, enteroviruses, influenza, parainfluenza, respiratory syncytial virus, human metapneumovirus, adenovirus, coronaviruses), herpesviruses (Epstein-Barr virus [EBV], infectious mononucleosis, cytomegalovirus [CMV], herpes simplex virus [HSV]), and other (eg, HIV). Less often, this syndrome is caused by bacteria. Streptococcus pyogenes (group A streptococcus [GAS]) is responsible for the majority of cases of bacterial pharyngitis; group C or G streptococci are also commonly isolated. Rarer bacterial causes include Mycoplasma pneumoniae, Arcanobacterium haemolyticum, Fusobacterium necrophorum, Neisseria gonorrhoeae, and Corynebacterium diphtheriae. 2. Reservoir and transmission: The majority of pathogens listed above infect the human respiratory tract and are spread by droplets or close contact. Many people with these active viral or bacterial infections may not be overtly symptomatic but can still transmit infection. Note that the detection of GAS in the throat does not imply active infection; many individuals can be colonized with GAS for prolonged periods. 3. Epidemiology: Given that most pharyngitis is caused by respiratory viruses, this infection is most commonly observed in the fall, winter, and early spring. Risk factors are very dependent on etiology. Contact with young children predisposes to infection with respiratory viruses and herpesviruses. Sexual contact is an obvious risk factor for HIV and N gonorrhoeae infection (the latter occurs via oral-genital contact). Arcanobacterium haemolyticum is more commonly found in adolescents and young adults. Corynebacterium diphtheriae is extremely rare and usually occurs in unvaccinated individuals who travel to areas where diphtheria is still endemic. 1) Respiratory viral infection: The incubation period varies between 1 and 6 days, depending on the pathogen. The patients are often contagious from 1 or 2 days before the onset of symptoms and can often shed virus for up to several weeks. 2) Herpesvirus infections: EBV has an incubation period from 30 to 50 days. The incubation period for CMV is not well defined. 3) GAS: The incubation period for pharyngitis is 2 to 5 days. The patients are contagious up to 24 hours after the start of an effective antimicrobial treatment or for ~7 days after the resolution of symptoms in the case of no antimicrobial treatment. The risk of transmission to household contacts is ~25%. 1. Viral pharyngitis is more likely to be associated with myalgia and respiratory symptoms, such as rhinorrhea and cough. Adenoviral infection commonly also causes conjunctivitis. Enteroviral infection, most common during the summer, can cause ulcerations on the posterior pharynx (“herpangina”). Many viruses can cause generalized rash. Infectious mononucleosis (most frequently EBV or CMV infection) can cause exudative pharyngitis, generalized lymphadenopathy, and splenomegaly. HSV infection often causes erosions and ulcers in the anterior part of the oral cavity. 2. GAS pharyngitis is much less likely to have associated rhinorrhea, cough, or rash. It is much more likely to have pharyngeal and tonsillar inflammation (mucosal erythema and edema), palatal petechiae, well-demarcated pharyngeal/tonsillar exudates (Figure 1), and associated cervical lymphadenopathy. Fever is more often high grade. Abdominal pain, nausea, and vomiting can occur in children. 3. Natural history: The vast majority of pharyngitis cases, bacterial or otherwise, resolve spontaneously within 3 to 7 days. Untreated GAS pharyngitis is associated with an increased risk of rheumatic fever (primarily in children) and a slightly higher risk of suppurative complications (eg, peritonsillar abscess). 1. Rapid GAS antigen-detection tests: Material: throat swab (see below). The tests have moderate sensitivity and high specificity. A positive result confirms GAS infection, whereas a negative result excludes infection in immunocompetent adult patients; in children, or in patients in whom the likelihood of GAS infection is high, a negative rapid test result requires confirmation using culture or a nucleic acid amplification test (NAAT). 2. Throat swab culture is performed in patients with suspected GAS infection (based on symptoms such as sore throat, fever, red and swollen tonsils when a rapid test is not feasible) or to detect another bacterial etiology; in latter case, notification of the microbiology laboratory is necessary to ensure the appropriate transport media and processing of specimens. Swab specimens should be collected from both tonsils and the posterior wall of the pharynx, avoiding the tongue and cheeks. Culture is the only method that permits GAS susceptibility testing. 3. Nucleic acid amplification methods (eg, polymerase chain reaction [PCR]) are becoming more affordable and available. These methods are both sensitive and specific, so culture is only required if antibiotic susceptibility data are needed; furthermore, they are much more rapid than culture (though not quite as fast as commercially available rapid tests). Clinical scoring systems are often used to determine who requires microbiologic testing to confirm or exclude the diagnosis of GAS pharyngitis. Note that in some scenarios the likelihood of GAS infection is high enough to make scoring or diagnostic testing irrelevant (eg, a child with fever and sore throat with a sibling with confirmed GAS pharyngitis). 1. Centor score: For this score, validated in adults, one point is given for each of the following (total score, 0-4): fever by history, absence of cough, tender anterior cervical adenopathy, and tonsillar exudates. 2. MacIsaac score adjusts the Centor score for age-related probability of GAS infection; one point is added to the Centor score for patients aged 3 to 14 years and one point is subtracted for those aged >45 years. For scores 0 and 1, only symptomatic treatment is suggested, whereas for scores 4 or 5, treatment with antibiotics is recommended. For scores 2 or 3, the preferred option in reliable patients is to perform a rapid antigen test; if negative, it is followed by throat culture. If follow-up cannot be ensured, you may consider treatment with antibiotics for score 2 or higher. 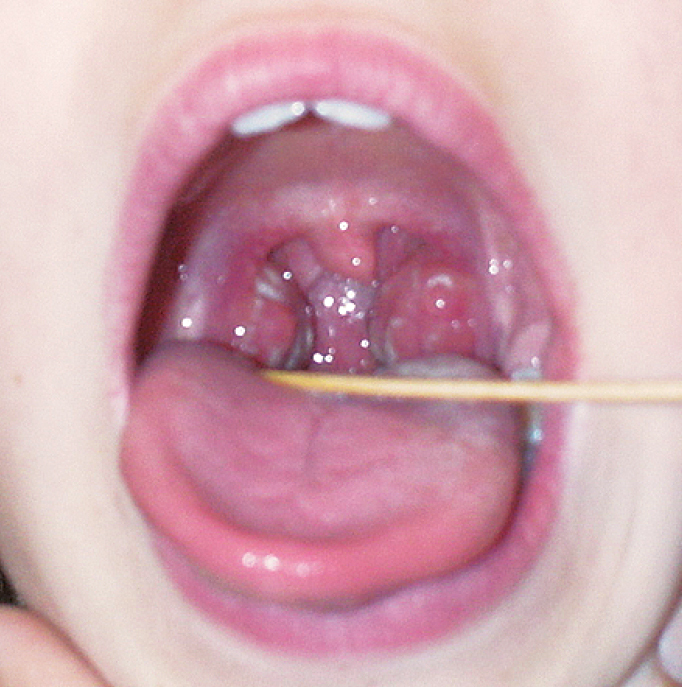 1) Infectious mononucleosis caused by EBV infection (clinical features very similar to streptococcal pharyngitis). In addition to exudative pharyngitis, it is often accompanied by disseminated lymphadenopathy and splenomegaly. A similar clinical picture may be caused by CMV and Toxoplasma gondii. 2) Rhinitis with postnasal drip causing sore throat (extremely common). 3) Epiglottitis or tracheitis: These conditions are potentially life-threatening due to airway obstruction that is not easily managed with endotracheal intubation. Patients are often toxic-appearing with high fevers and audible stridor. Epiglottitis is predominantly caused by Haemophilus influenzae b and is seen primarily in countries without universal immunization against this pathogen, where these infections are endemic. 4) Infectious esophagitis, predominantly caused by Candida and HSV. 5) Gastroesophageal reflux disease, thyroiditis, throat cancer: Chronic sore throat (sometimes with inflammation) is the dominant symptom. 1) Oral penicillin V (INN phenoxymethylpenicillin) 500 mg (1 million U) bid to tid or oral amoxicillin 1000 mg once daily or 500 mg bid for 10 days. Alternatively, a single dose of 1.2 million U of IM benzathine penicillin G (INN benzathine benzylpenicillin) can be used. These agents should always be used unless contraindicated because of allergy, as GAS is universally susceptible to penicillins. 2) For patients with type I hypersensitivity to penicillin (eg, anaphylaxis, generalized urticaria): Use macrolides (oral clarithromycin 250 mg bid for 10 days or oral azithromycin 500 mg on day 1, then 250 mg every 24 hours for 4 days) or oral clindamycin 300 mg tid for 10 days. In many countries, macrolide resistance is much more frequent (10%-20%) than clindamycin resistance (<5%) but macrolides have a more favorable adverse-effect profile. 3) For patients with non–type I hypersensitivity (eg, rash): You can use cephalosporins, such as oral cephalexin 500 mg bid or oral cefadroxil 1000 mg once daily for 10 days. Trimethoprim/sulfamethoxazole and tetracyclines are generally believed to be ineffective. 1. Bed rest as needed, ample fluids (particularly in patients with fever). 2. Acetaminophen (INN paracetamol) or nonsteroidal anti-inflammatory drugs (eg, ibuprofen) to control pain and fever. There is almost never an indication to do routine throat swab testing for GAS after treatment or in the absence of sore throat, as GAS throat colonization is common, and resistance among GAS to penicillins has not been documented. For those with recurrent pharyngitis that is associated with positive microbiologic testing for GAS, eradication can be attempted; for this, cephalosporins or clindamycin for 10 to 21 days may be more effective than penicillin. 1) Suppurative complications (early): Retropharyngeal abscess, suppurative cervical lymphadenitis, suppurative otitis media and/or mastoiditis, suppurative sinusitis. 2) Late immunological complications (very rare in adults): Rheumatic fever, acute glomerulonephritis. 3) Other complications (very rare): Bacteremia, pneumonia, toxic shock. Prognosis is good. Even when untreated, streptococcal pharyngitis resolves spontaneously. Complications in adults are rare.